Here are some of the photos from my DIY wedding. I had my wedding in the backyard of a friends home in Brooklyn Heights on a hot spring day in May of 2010. My husband (who everyone calls Miles, his name is not Miles Miles), a couple friends and I did all of the decorating ourselves the day before the wedding. My dress was designed by me and the embroidery on the front was hand stitched by me. I don't have a lot of photos of the reception because I asked a friend to do the photography (I may regret this a bit) and he didn't take a lot of photos at the reception of the centerpieces and buffet. I made the centerpieces and grew them in pots on my balcony. 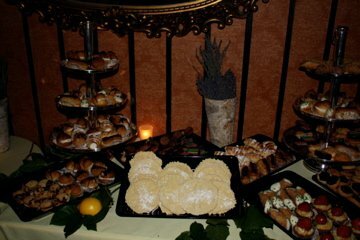 I also chose to have an Italian cookie table rather than a cake and I designed the layout for the cookies and picked them all out.